If you have a fire alarm system in your home, a new requirement in the National Fire Protection Association’s (or NFPA) fire alarm code will change the way that you must maintain your system. Every three years, the NFPA updates their code in order to improve life safety or clarify previous editions that have either been misunderstood or misinterpreted. 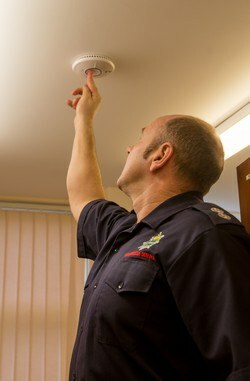 The latest update has a new mandate that home fire alarm systems that are controlled through a burglar or fire alarm panel must be inspected every year by a company qualified to carry out such inspections. Your security company is also required to inform you of this change and to remind you annually to schedule these inspections. As a consumer it is important that you understand this new requirement and what you must do to maintain compliance because this is a major residential fire alarm code change. What Exactly Does the New Code Say, and What Does it Mean? 14.4.6 Household Fire Alarm Systems. NFPA 72 2013, 14.4.6.1 Testing. Household fire alarm systems shall be tested by a qualified service technician at least annually according to the methods of Table 14.4.3.2. The installing contractor shall be required to provide this information in writing to the customer upon completion of the system installation. To the extent that the fire alarm system is monitored offsite, the supervising station contractor shall provide notice of this requirement to the customer on a yearly basis. There are two important takeaways from this new residential fire alarm code change. First of all, this mandate applies only to fire detection systems that are capable of being monitored “offsite” by a central monitoring station. George Condon, co-owner of Northeast Security Solutions, explains that “This new section does not apply to high voltage ‘standalone’ fire systems, but only to low-voltage systems that are connected to a dedicated fire panel or a to a burglary system.” Whether or not the system has central monitoring station, these inspections are now mandatory. Why the Change, and How Can I Keep in Compliance? Although this may seem like a drastic change in the fire alarm code to homeowners, businesses with fire alarm systems have long been required to undergo these annual inspections. While these inspections will add a new cost, similar requirements imposed on businesses have saved them time, money, and hassle – not to mention potential lives – by dealing with any equipment and performance issues up front rather than waiting for an actual emergency to reveal any safety deficiencies. When at your home, the inspectors will ensure that your system is fully operational. They will also ensure you are meeting fire alarm code requirements such as replacing smoke detectors every ten years from the date of manufacture. Finally, the technicians will inform you of any recommended changes such as bringing your home up to the current edition of the code which requires installing a smoke or heat detector inside every bedroom within ten feet of the door, outside of every bedroom within twenty-one feet of every door, and at least one detector on every floor of the house. As a reminder, batteries should be replaced every year as a precaution. What’s the Impact of the Change? While these code changes may appear to be a lot to keep up with on a regular basis, we do our part to notify you when pertinent changes affect you. This new code requirement simply ensures that your fire alarm system will work when you need it to work. The fire alarm code is constantly being updated to decrease the risk of harm to people and these inspections will also give you an opportunity to update your system to the current standards. Many times homes are required to be brought up to current standards before you were allowed to sell the house. Performing the improvements ahead of time will allow you to enjoy the benefits and peace of mind of having an up-to-date fire system while you live in the house. This new section of the NFPA code makes sure that you receive the highest possible payback on your life safety investment.